Carolan arrives back at the Mixed Reality Lab. The team gathers round. Strings off. Out with our phones. The big question is how well do the patterns scan? General relief as initial tests are promising. All of the patterns can be scanned, though the headstock logo can be a bit tricky and has to be approached face-on due to possible interference from the protruding tuning pegs, while one of the three repeated codes on the front appears to be broken and may need some cleaning up. Further testing will explore the impact of shadows and reflections under different lighting conditions from natural daylight to bright stage lights. 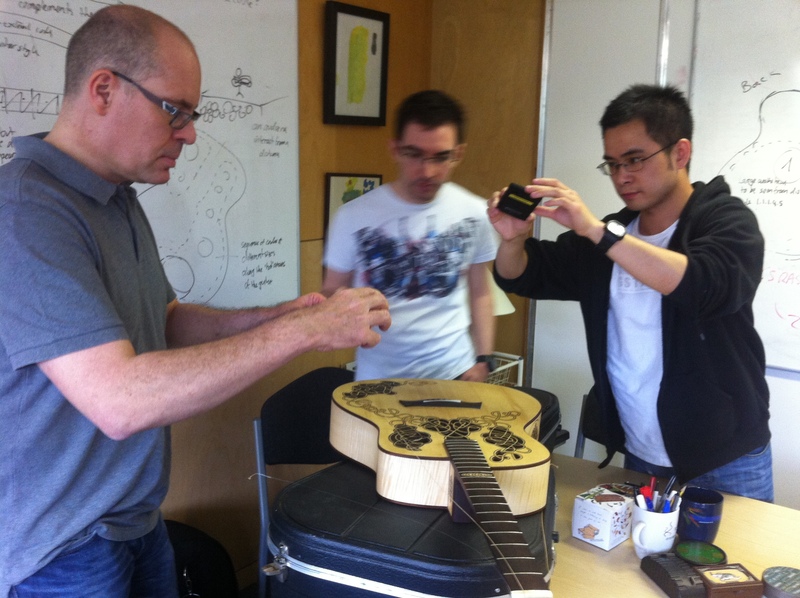 So it seems that we have a working interactive guitar. Now we need to build its history. Fortunately for us, Sean Riley from the Computerphile YouTube channel is stopping by to record an interview. He even takes time out to play a tune himself. In respect of the time-honoured tradition instigated by music shops, he may well be the last person ever allowed to play Stairway to Heaven on this guitar. Watch Sean’s interview below. An interview about the Carolan guitar (and a quick tune too of course) published on the Computerphile YouTube channel.